Description: (A101032) This is a brand new Tippmann Arms M4-22 Elite-L Semi-Automatic rifle chambered in 22 lr. 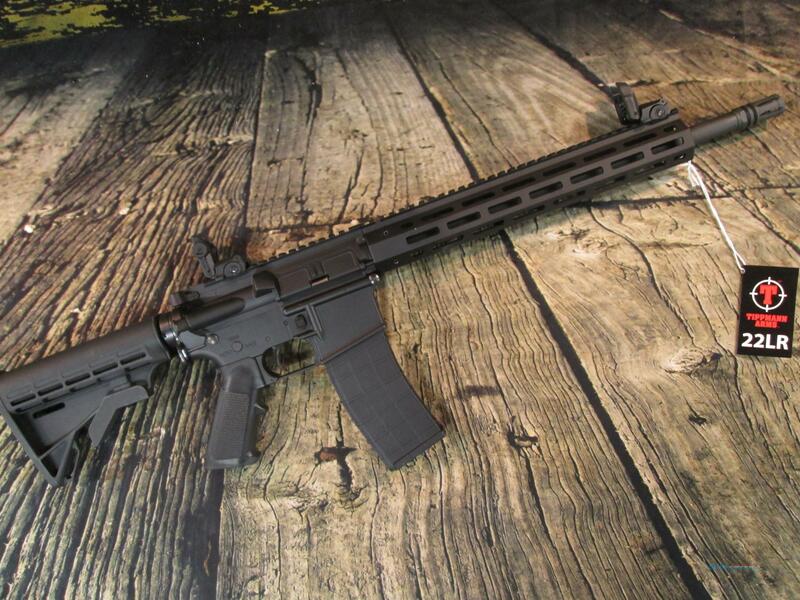 This M4-22 is a premium 22 caliber rifle with an aluminum upper and lower receiver, and all the features of a true M4. The M4-22 is largely mil-spec compatible. It features a 12" Aluminum handguard, standard 1/2x28" threaded 16" solid steel barrel with flash suppressor, Adjustable flip-up Sights, working forwards assist, working bolt catch and charging handle, and push-pin takedown. It weighs 5.7 lbs and comes packaged with one 20 round magazine, the box and manual. Tippmann Arms is a manufacturer in Fort Wayne, IN. Purchase with confidence! Over 11,000 firearms sold on GunsAmerica. We are a family owned & operated gun store located in Brookings, South Dakota. We have been in business since 1982. Purchasing Because we try to give our customers our best price possible, there is a 3% loss of cash discount for using any credit card/debit cards. We do accept money orders, cashier’s check, & credit card/ debit cards as forms of payment. Please, no personal checks. Shipments All firearms must be shipped to a Federal Firearm Licensed Dealer (FFL). Before shipping your firearm, we must receive a copy of your dealer’s FFL by fax, email, or mail. Once we receive payment & the FFL we ship your firearm within 24 business hours. We ship all handguns for $30 & all long guns for $20. Shipping exceptions Hawaii & Alaska- Please call or email for shipping price quotes. (Usually around $40) Insurance & Adult Signature is included in price of shipping. All of our firearms are boxed and packaged to insure safe delivery. Shipping To States With Special Requirements California, Connecticut, Hawaii, Maryland, Massachusetts, New York, New Jersey, Washington DC, and possibly more states have special requirements. Every state in the U.S. has different laws, rules, & regulations & many states have restrictions as to what you can and can not own. **Finding out your State’s laws are up to you. When ordering from one of these states, you will need to verify with your local FFL dealer if the Firearm is legal before we will ship it to them. If you order a firearm without checking to see if is legal, & we ship to your dealer only to find out it is not legal, the gun will have to be returned to us at the customer’s expense. All shipping costs, 3% loss of cash discount, & 10% restocking fee with be forfeited. USED FIREARMS HAVE A 3 DAY NON-FIRE INSPECTION PERIOD. MUST CONTAIN ALL PACKAGE CONTENTS that were shipped with the gun. Returns. Customer agrees to a 10% restocking fee under certain conditions. Please note that shipping & credit card fee WILL NOT be refunded. Please email or call us about any Return or Warranty policies. All new firearms are warrantied by the manufacturer and covered under the manufacturer’s warranty policy. Please check your manual or manufacturer’s website for contact information.